Dr. Aaron Shapiro is one of the most highly regarded facial plastic surgeons in the Philadelphia area. He has been recognized as “Top Doc” by Main Line Today, Philly Style, and Philadelphia magazines. Dr. Shapiro performs a full range of facial plastic surgery procedures. Dr. Shapiro pioneered the minimally invasive Mini Lift procedure and trains plastic surgeons in the technique nationwide. Dr. Shapiro provides medical and surgical care for patients suffering from complications, diseases, and disorders of the ears, nose and throat, as well as the related structures of the head and neck. Dr. Shapiro treats various disorders concerning upper airway breathing, balance and hearing among other functions. Dr. Shapiro attended the University of Pennsylvania School of Medicine and served as a surgical intern at The Graduate Hospital. He then completed a residency in Otolaryngology Head and Neck surgery at the New York Eye and Ear Infirmary. Following residency he was chosen as one of only forty physicians to complete a fellowship in Facial Plastic and Reconstructive Surgery. This fellowship was under the direction of Dr. Regan Thomas at the Barnes Hospital in St. Louis, MO. Dr. Shapiro then returned to Philadelphia where he has been in practice since 1993. He has served on the teaching faculty of Thomas Jefferson University Hospital where he has been involved in the training of residents and medical students since 1993. 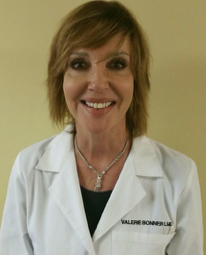 Valerie is an active member of the Society of Plastic Surgical Skin Care Specialists. She is a Pennsylvania state board certified esthetician. She is also certified with the American Academy of Medical Aesthetics and in the application of Candela Intense Pulsed Light System (IPL). Medical skin treatments performed by Valerie use a combination of dermaplaning, diamond-tone microdermabrasion, Thermismooth radiofrequency treatment and a variety of acids for correction of skin conditions including irregular pigment, rosacea, acne and the appearance of aging.